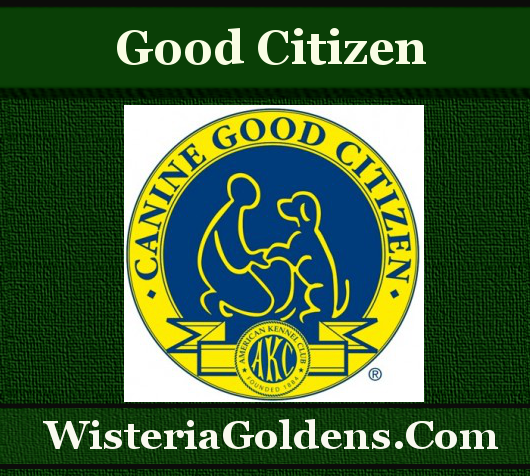 This page is about the AKC’s Canine Good Citizen® (CGC) Program (an overview and resources). A Good Citizen: Find out more about a Good Citizen (and other program titles), Where to find Training/Testing, and how the process of developing ‘Title” skills benefits you and your dog. The AKC offers a list of AKC Clubs which provide training classes and testing for programs designed to improve and reward you and your dog for developing skills. Developing skills, in the areas required to earn each of the program titles, not only gives you and your dog enjoyable day-to-day experiences, but also provides evidence of communication development and preparation for Therapy and/or Service titles. What is the Canine Good Citizen program and who can participate? Details HERE. Where to find training and testing. Find out more HERE. We love to hear from our Wisteria Goldens Families about Wisteria Goldens puppies. Submit an update here. After you submit your update, we will add it the website. Click here to see previously submitted updates from our Wisteria Goldens Families. Earning the Good Citizen title satisfies some of the Therapy Dog program certification requirements. Read more about the AKC Therapy Dog Program here.